The last twelve months have seen some exceptional works by some of my absolute favourite writers, as well as a handful of duffers from those who should know better. Here, then, is my highly subjective round-up of the year that just was. 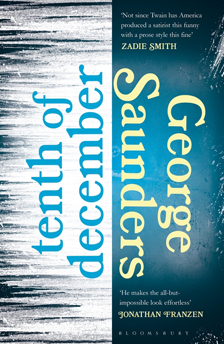 Any new collection of stories from George Saunders is an event. The concern is that the throngs of Saunders devotees will evangelise with increasingly hyperbolic praise, no matter what he does. This collection was six years in the making and six of the ten stories have been previously published by The New Yorker. It is true that stories are to be savoured one at a time, but the collection needs to work as a whole too and bring together all the themes and voices into a satisfying meaty mealful. In Tenth of December, that is exactly what you get. From start to finish the words whip and crack across the page. Sentence after sentence made me blink and re-read, to relive the thrill of surprise. Saunders has invented his own literary style within the confines of the short story form. This is cocksure, supple writing that plays fast and loose with formal expectation, though this is not to suggest it is all style and no craft. Style is a slippery eel and can for the most part be an amalgam of influences updated and barely refined. This is something else, to do with dangerous linguistic territory, and Saunders has nailed it. There are larger themes thundering under the collection. Cruelty of every sort bleeds off the page: the physical excesses of torture or scientific experiments on the living, and also the familial cruelties of parents. An insanely optimistic mother is tarred with the same brush as a mother who chains her son to a tree. What Saunders does so masterfully is represent the consciousness of ‘self’ as a rolling, messy tangle. In many of the stories the narrator takes us, via a slightly shambolic, often angry, often vain and righteous route, to a terrible realisation about the character’s place in the world. The prose lilts through non-verbal interior conversations that wind and deviate, yet never stray from the strictures of the form. The narrator in ‘Puppy’ for example chatters to and chides herself as she drives, and ‘Al Roosten’ indulges in all manner of vengeance and justification though not without the aching insecurities of Eliot’s Prufrock, as we spend some time with him onstage at a local fundraising event. What sets this collection so far beyond the competition is that behind all the zinging bravado we have come to expect from Saunders there is inescapable heartbreak. For all the flash and wit and way with words underlying these funny, strange, and most times cruel stories, are characters on the brink of spiritual collapse. Buy this collection for thrill-seeking writing and for the sonorous bass note of pathos that anchors it. It is frequently funny, shocking and wise, often in the same breath. Under the sting and swagger, Saunders’ stories hold up a murky mirror to the human condition. The power of these stories and the collection as a whole is a suggestion that behind every door, there is someone who is just one wisecrack away from inconsolable tragedy. 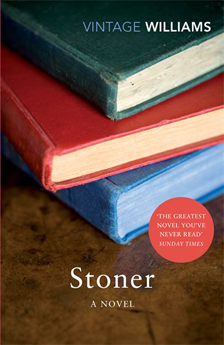 Levy’s collection of ten short stories was published hot on the heels of her Booker nomination for Swimming Home. The stories give the impression of a loose and easy confidence despite the various anxieties and failures they portray, and often have the feel of fragments overheard on a psychiatrist’s couch. These are interrupted relationships and splintered stories, yet they have a completeness too. This comes less from the telling and more from the gaps that allow the reader to project themselves into the fray as various characters try to find their land legs, negotiating the tilt and sway of love in as many forms as they find it. Although the writing is tight, curious and bold, it has great depth. There are some heart-stopping sentences that roll around the tongue with all the “stylish angst” of the eponymous drink, and astonishing images such as that of a pear stuck in a liqueur bottle: ”The pear was peeled. It was naked pear.” Sentences are wrought tight and true so that each hyper-personal moment can easily bear the weight of this poetry-filled manifesto. The narrator of the title story describes his love of rain and how it exaggerates his body movement and “injects it with 5ml of unspecified yearning.” The yearning may not be specified but the precision measurement renders this sentence extraordinary. The individual stories’ titles too have a geography (Vienna, Rome, etc.) as if love were being mapped across Europe. But this is modern Europe, its boundaries pencilled in over the dark ancient forests that our modern-day Quasimodo imagines under the table when he stoops to lift a fork from the floor in the Polish Club in Kensington. This is modern- anti- post- neo- trans-European. Language, passports and identification are all recurring themes in the collection. Anxieties about love and gender politics manifest themselves physically in the male protagonists, often in itching skin; their biographies have become their biology as they scratch at the surface of meaning. Stories about love must also be stories about gender, and if we are to politicise the landscape further then these psychosomatic welts speak to the anxiety of the continent as much as the variations of ‘European’ that now populate it. National boundaries no longer hold, traditional gender roles fall with them, and masculine anxiety accompanies that shift. What is exemplary about this thoroughly European collection is how it works as a whole; lingering on as more than the sum of its parts, so that each elliptical story becomes by virtue of inclusion its own larger narrative with a broader moral and political message. Even though we are by Levy’s deft design momentarily dropped into an aspect of a character’s exploration of love, and the toll it might exact, the collection has a much wider reach. In the second installment of Knausgaard’s extraordinary six-volume 360,000-word project (the third, Boyhood Island, is released in English translation in March 2014), the narrator again shares both name and circumstance with the author. Any number of angry and inadvertent Norwegians found themselves playing key roles in the first volume, covering most of his childhood and eventual escape from the bounds of his father’s ire. I assume things only got worse with Karl Ove’s friends and relatives as each volume was published. I long to have sat in on one of the ‘legal edit’ meetings at his publishers. This is of course fiction and yet the narrator shares so much in common with the author that their lives implicate each other in an alluring way. The writing is painful and acute with a near pathological insistence on truth. More than that though, Proustian obsessions with the repetitive and the pedestrian infuse Knausgaard’s work in a rare and thoroughly mesmerising manner so that a dinner sequence is described in such aching detail that the main course only appears 160 pages into the delectable verbal feast (it is a lobster). This is a dinner and a book to be digested and savoured one bite at a time, and the power of these sentences comes from their acute specificity. Where he is not Proustian is in the immediacy and the intimacy of the language. What is exemplary about this volume – somehow even more than the first – is that in an era of quick-fix emotional and narrative solutions a book of this scope still feels worth the time. 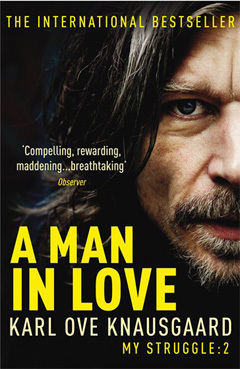 The detailed archaeology of his life that walks us around his house, his writing room, the squalor of his recently dead father’s life, and ultimately through the anxiety and ultimate disappointment of this ‘man in love’ is addictive. I suspect that it has as much to do with the truisms that he offers. Every night he is fantastically surprised by the fact that his children need to eat. No matter the regularity of this event, he is still floored by it, and a shambolic misery to find and cook a meal for them ensues. He is overwhelmed by the mundane over and over again. It is possible that these books feed the parasitic peeping-Tom in the reader. In an age of instant media access to other people’s lives that run over entire evenings in reality-TV segments, we are happy to spend hours wading through the minutiae of Knausgaard’s world. We want to know exactly how the rolling papers for his cigarettes feel as he takes them from their wrapping, the precise measure of guilt to righteous anger he feels as he leaves his wife to deal with their domestic shambles so he can head to his office to write. All these painfully awkward moments, be they his own or those he observes on street corners or though a relentless plundering of other people’s lives, are no more alien than our ability to watch a four-hour Kardashian marathon. And yet this is language wrought simultaneously universal and molecular. There is a Biblical scope and reach to the work and a resonance that allows him to sanctify our obsession with the lives of others in a way that is often achingly painful to read. Our loves and disappointments reside in the details. In cups of tea and shared cigarettes. Our self-worth lies in our ability to provide for our children at the same time every day, or to arrive on time or in reminding ourselves to be kinder and then failing. Our failures are not mythical as we might hope, but rather they occur in the seconds we did not speak or in that moment when we decided to let the phone ring, though we knew who was calling and why. Failure and in particular Knausgaard’s failures underscore this novel of attrition. He is frequently embarrassed: by himself, his wife, his life. There is sometimes a comedic element to these failures and yet in that, a cruelty too. He portrays his wife as lazy and stubborn and himself as a sullen narcissist. Social taboos around gender politics, race, fatherhood, ageing and marriage are all thrown in, not in a political treatise but in a snide aside always just out of earshot. These volumes are a record of the new religion of self, presented with no less a spiritual resonance for their full frontal confrontation of death and love. 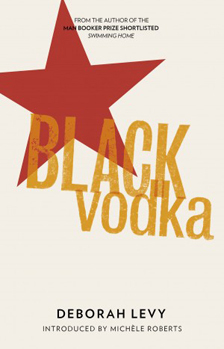 This may be the sleeper hit of a half-decade. After a seeping, subtle start the language burrows in and after seventy or so pages I was mesmerised. This is the story of a life not lived, missed opportunities, disappointments and a hankering after what might have been. This is the anti-Gatsby and that is perhaps the reason Americans did not take to the novel when it was first published in 1965. This is a failed American dream and at times painful to read despite its lucid, magnetic prose. It is a book that is utterly unpretentious, simply the story of a man’s life. It is in many ways old-fashioned and this may be what worked against it originally, but the language and the man whose aching life it inhabits are unforgettable. 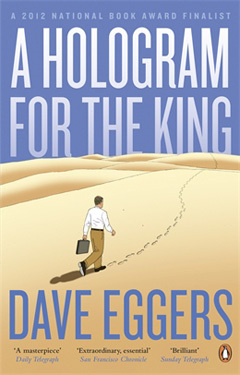 An extraordinary book in which Eggers allows us into the head of a kind of middle-American jobsworth rarely seen as rich literary fodder, then supplants his hapless, dissolute character into Saudi Arabia. Alan Clay is a latter-day Willy Loman struggling to reconcile his expired faith in manufacturing America and trying to absorb the transfer of power and commerce to the Middle East and China at the same time as he stumbles through his troubled relationship with his daughter via stuttering emails. Like America, Alan is broke, diseased and struggling to absorb his new identity. He is clapped out and bumbling and the reader winces at and is tormented by his social and emotional incompetence. 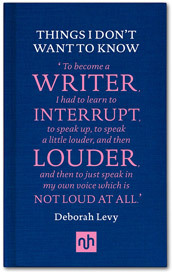 Deborah Levy’s rare excursion into non-fiction is a fascinating and frequently heartbreaking response to Orwell’s essay ‘Why I Write’; an exploration of how she had to excavate her own voice as a woman before she could begin to find her writer’s voice. Her account of her period of muteness, an inability to speak above a whisper when she refound her voice, and then much later finding her strength on the page, has a choppy, fragile power. There is some unevenness in the language, one section soaring off the page to goosebump altitudes and the next offered in a flatter, reportage-like tone. This is an essay whose observations about what makes us writers and where that comes from (be it exile, pain, or personal history) are beautiful and powerful. The book that should never have been. 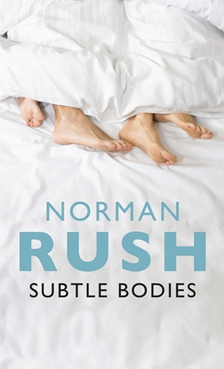 Norman Rush’s ten-years-in-the-making novel was for me the most saturating disappointment of the year. I re-read sections in the hope that I may have misread or misunderstood, but page after page of claustrophobic, self-righteous pandering to mediocre and unlikeable characters makes this one book above all others I wish I had not read. A reunion of college friends after the untimely death of the cult-like leader of the group is meant to erect the scaffold of a mystery that will allow us to ask questions about who we are, where we have been and how our values sit in the world as we age. Instead, when the book wasn’t preachy it was plain boring and the characters were flat stereotypes that ultimately went nowhere, leaving the simple question: Why bother? Fiona Melrose completed an MA in Politics and Literary Criticism at Wits University, Johannesburg, and spent some time as a financial markets analyst in London before relocating to Suffolk to complete an MA in Creative Writing at Birkbeck, University of London and write her first novel. She is represented by Jo Unwin Literary Agency.